Looking for some best chocolate in Paris more local spots when you visit Paris? Make sure you get yourself a copy of our 2019 INSIDR Free Paris Travel Guides! While there are an abundance of chocolatiers in Paris, our top 5 best chocolate shops in Paris will make you come back many many times more before departing from the French capital! Whether you prefer white, milk or dark chocolate, read on to learn about the best chocolate in Paris, and where to buy chocolate in Paris! Additionally, we have included a guide of where to get the best hot chocolate in Paris for the colder days. 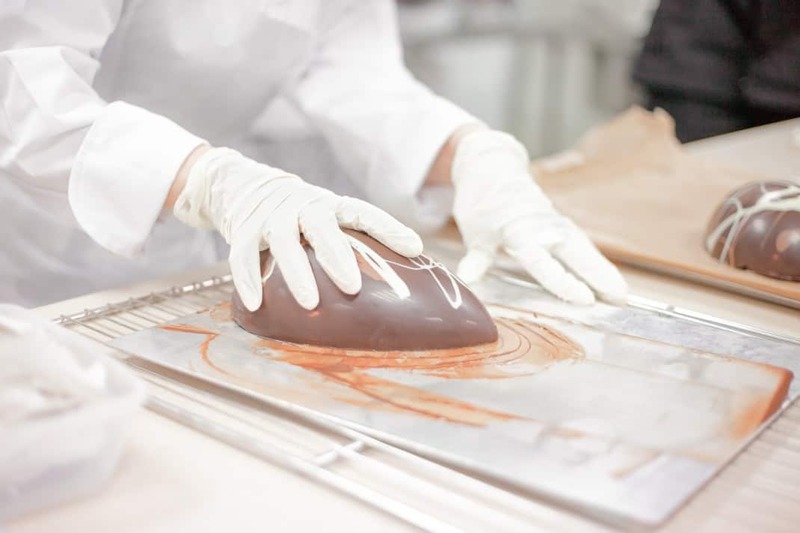 Chef Alain Ducasse creates original and seasonal chocolate creations, especially around Valentine’s Day and Easter! You can also buy a simple chocolate bar if you’re not looking to indulge in a chocolate creation. There are four different shop locations in Paris, so don’t miss out! August Pralus, founder of Pralus, opened his first chocolate shop in 1948 and the company has since lived up to its familial obligation to the chocolate house. Today this spectacular chocolate shop has been taken over by August Pralus’ son, who provides the same high quality chocolate that his father did. Their cocoa plantation is in Madagascar, and the taste is unbelievable. Also, for an innovative twist on how some of the best chocolate in Paris is used, don’t miss out on trying their breads with chocolate! You can find Pralus at two different locations in Paris. You can shop also on their website! Some of the best chocolate you can buy in Paris is a Patrick Roger. Their chocolates come wrapped in a turquoise box, making every bite luxurious and indulgent! If you give this brand of chocolate wrapped in the fanciest of wrappings as a gift, you’ll be sure to make a loved one happy! The most visited shop is on Boulevard Saint Germain, but there is also many others to choose from. For a less fancy but still excellent chocolate fix, you can go to Chocolaterie Cyril Lignac in the 11th arrondissement for a chocolate treat, bar and even yummy hot chocolate! Their chocolate bars are less expensive than the more well known chocolate shops, making it both a delicious treat and bargain! Oh go on… One more then! Every since 1995 in Brussels, Pierre Marcolini chocolate has been one of the leading luxury chocolate shops. Their little black boxes of chocolate are packed so delicately, and are meant for true chocolate lovers – a real shoe-in for the best chocolate in Paris list. Also in the shop there are many chocolate desserts that you should definitely sample! Last but certainly not least, for the best hot chocolate in Paris, go to Angelina’s Tea Room. Angelina’s has other locations such as in Versailles, outside the Luxembourg museum, but you can go to the main location on rue de Rivoli and sip fancy hot chocolate like royalty!